Agistri Inn: Agistri: a small green island on the Saronic Gulf with crystal deep blue water. The island offers you a relaxed, yet exciting holiday, whether you are travelling as a family, individual or with friends. Discover the island through the pine paths, find your favourite beach or explore the hidden paths and caves. The island is the ideal destination for those who want to taste natural beauty in abundance. Sandy beaches, clear blue waters, Greek traditional food, romantic evenings and sporting activities are all available on this small island. with its gently shelving sandy beaches and inviting environment. The island is often described as the best kept secret of the Saronic Gulf and only 8 minutes away from neighbouring island, Aegina. It is also worth visiting the various archaeological findings at the Cultural Centre of Megalochori and the Greek Orthodox Churches. Take a boat ride around Agistri and discover the hidden coves, the small pebbled beaches and the small islands close to it. Megalochori and Skala are the most popular and organised beaches on Agistri, while Aponissos is famous for its exotic beauty. For people who love exploring beaches, Chalikiada and Dragonera are a must-visit. The small island of Agistri is also known for the small villages and green nature. Due to its closeness to Athens, it is frequently visited as a relaxing weekend destination. 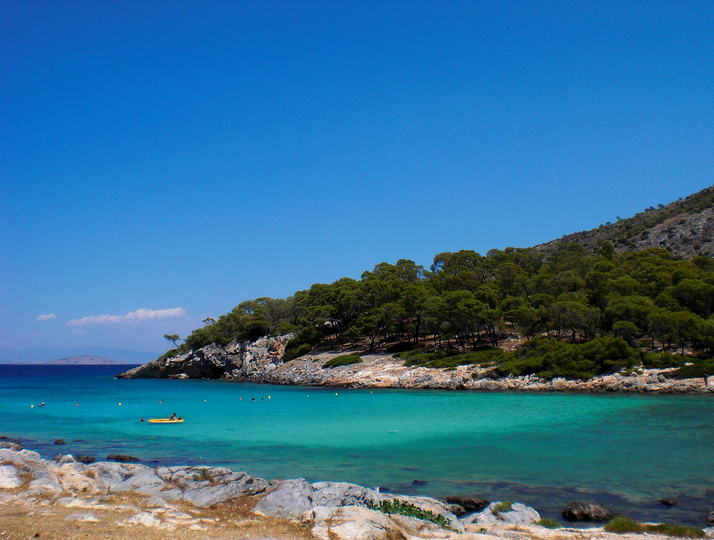 The clear blue sea of Agistri beaches is also excellent for snorkelling and swimming. You can try also your luck at octopus fishing. This small Island can easily be explored by foot, boat, cycle, moped or car. Agistri is very close to the Aegina, the larger Saronic island of the Aegean. The island can be reached by numerous boats in approximately ten minutes. These boats include the Agistri Express and some small "water taxis". The island is also an hour by boat from the large Athenian port of Piraeus. For an interesting holiday, filled with new experiences, make Agistri your next destination.